What is Masse Moro? Masse Moro is a Norwegian Heritage camp with a rich history specifically created with a focus on sharing the history, arts and rich culture of Norway with our youth since 1979. Norwegian language is one of the key components to our program. Campers leave their American culture behind for 2 weeks and participate in daily activites in a hands-on atmosphere learning camp songs, Norwegian vocabulary classes, team sports, and a variety of traditional Norwegian arts, cuisine and Norwegian history. To learn more about District 5 Masse Moro Heritage camp, visit their website at http://www.massemoro.org. Looking for Masse Moro scholarships? Check out the 'Youth Scholarship" and "District 5 Scholarship" section of our Scholarships page. A new item Lodges can use when speaking to perspective Camp families or when searching for Masse Moro information. Welcome to Masse Moro ! Masse Moro – Sons of Norway’s 5th District Norwegian Heritage Camp will be celebrating our 40th Anniversary this year! Masse Moro has touched the lives of many of our young people and we look forward to celebrating with present and past campers this summer. The Masse Moro Camp will meet this year from Sunday, July 14 to Saturday, July 27, 2019. The camp is open to young people from the ages of 9 years old to 16 years old (as of the first day of camp). The camp is located in a beautiful wooded setting near Fall Creek, Wisconsin. Masse Moro is open to all who wish to partake in a very unique camping experience. Campers will participate in a variety of activities from archery to Viking Olympics; cooking lessons, including making lefse to cultural crafts, including rosemaling painting techniques; and so much more! 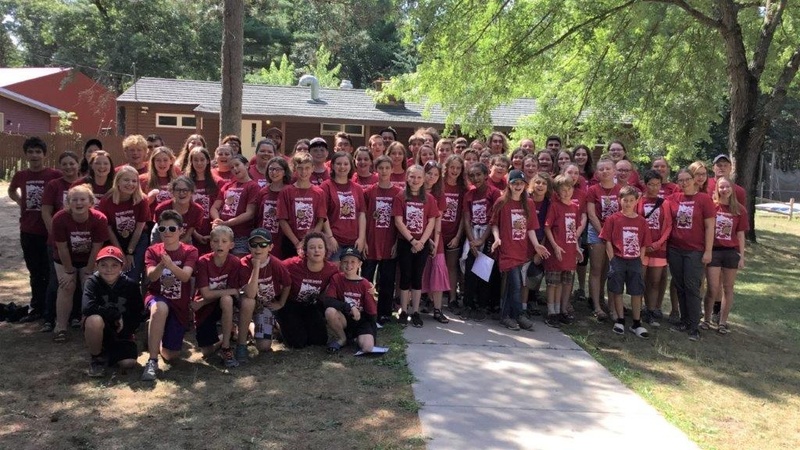 Most importantly, campers will learn about themselves as they explore their family’s heritage and network with others who share the bond of their Norwegian ancestry. The cost for our two week, all-inclusive camp experience is $800.00, a real bargain. Consider giving the gift of Camp to a young person you know! Local Lodges may provide supporting grants to their youth, and District 5 will match this grant up to $150.00 per participant. The number of supported campers may also be restricted by individual lodges. Check with your local lodge president for more details. Other scholarships are also available, but deadlines do apply for these scholarships and grants, so apply early. Campers are encouraged to invite a friend! Campers who recruit a new camper and apply by May 17th will receive $25 toward their tuition and toward the tuition of their recruit. Families may obtain registration materials by visiting the Masse Moro website: www.massemoro.org or by choosing: www.sonsofnorway5.com. Dropdown menus will lead you to the correct links. For more information or to obtain registration materials you may also contact me: Sandra Olson, District 5 Youth Director, at solsondist5@gmail.com or by phone at 715 698 3433. I look forward to seeing you at Masse Moro Norwegian Heritage Camp this July. Velkommen!